Book stack with bonus cat! Just what you always wanted to see, right? Momotaro: Xander and the Lost Island of Monsters by Margaret Dilloway - both purchased, the former for F2F discussion in May. The Day I Died by Lori Rader-Day - from HarperCollins (Wm Morrow imprint) for review. I made the mistake of opening this one and reading the first couple of pages, so I figured I'd better go ahead and mention it, rather than saving it for next week's Malarkey. It sucked me in so thoroughly that I may add it to my current reads, tonight. Yep, just one. Again. Sigh. It went a little slowly and I wasn't thrilled with the secondary opera theme -- The Mermaid's Daughter is a retelling of Hans Christian Andersen's fairy tale "The Little Mermaid" but with a twist, a curse that has lasted through 7 or 8 generations) -- but it turned out to be crucial, in the end, and I loved the ending. So, even if the musical subplot seems to drag a bit, I recommend sticking this one out. Since I didn't much feel like writing, last week's blogging ended up being better than I expected. 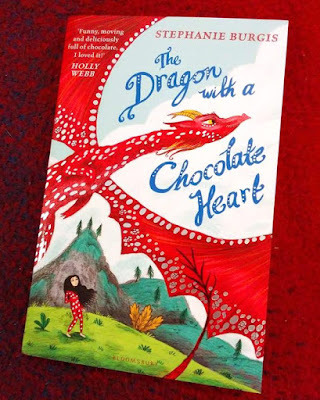 The Dragon with a Chocolate Heart is a middle grade book, so I ought to be farther than 50 pages but I fell asleep reading, last night. Go, me. 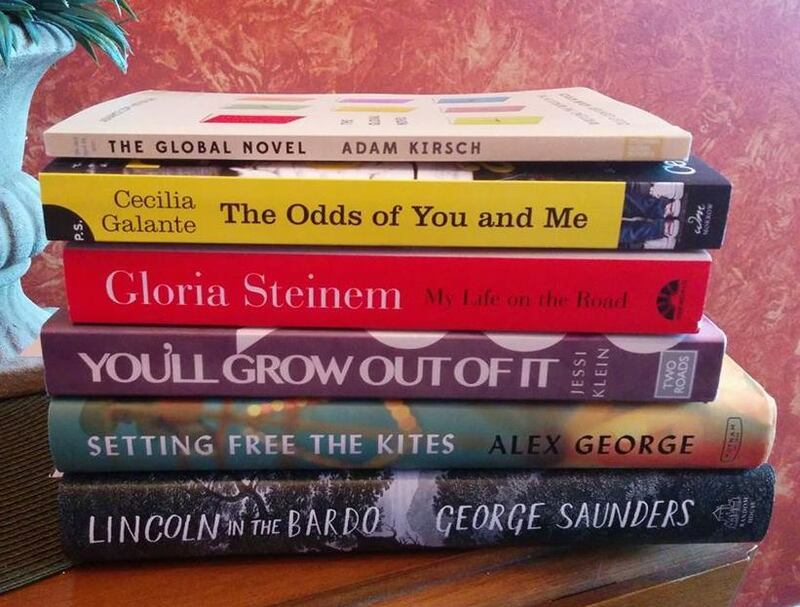 Not a brilliant reading month happening, here. But, again, I'm enjoying my reading so I have to remind myself to stop obsessing about quantity. Also, you may have noticed that two children's books arrived. 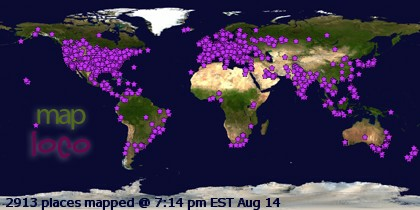 Well, that ought to bump up the numbers a bit. One can always use a children's book break. I adore picture books. If you look carefully, you can see what Isabel was doing in the background of the book stack photo, above. 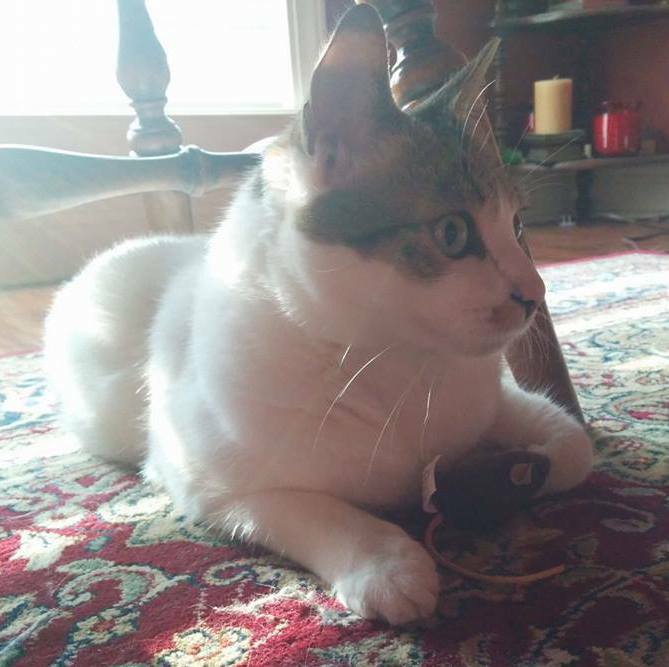 She was holding onto a toy mouse! 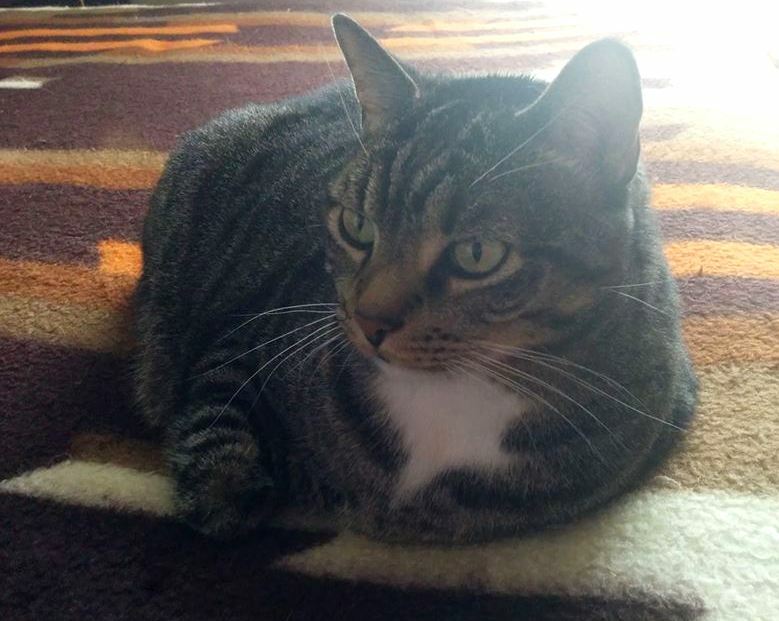 I didn't realize that till I crawled over to snap a closer image and saw the little mousie wedged between her paws. 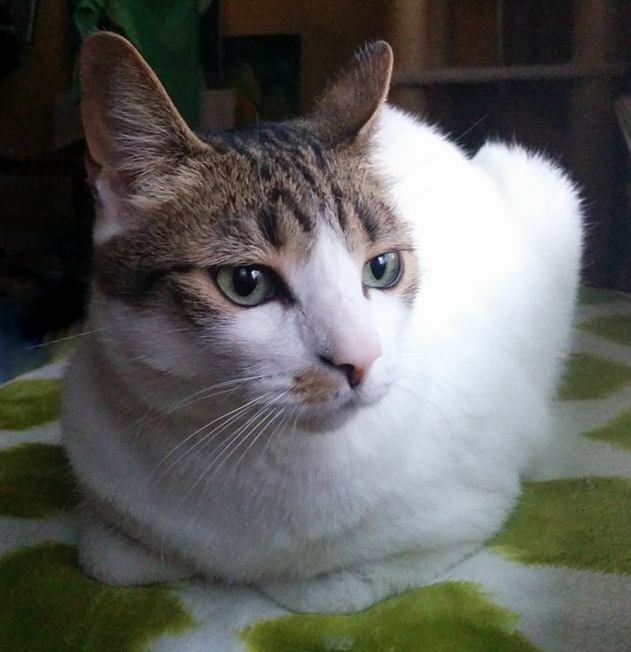 In case you missed the news: Scientists have discovered cats are nice (link to article). Yeah, some of us were well aware our cats like to socialize with their people, but it's nice to find out science is catching up. OK, I'm off to read. The only other news is that it's thundering and raining, outside, so I probably ought to unplug the computer. Happy Monday! She doesn't look very happy but Isabel was enjoying the fresh air coming through an open window before I damaged her calm. My copy of The Last One doesn't look like the image above, but I ordered a copy from Book Depository (probably the British release) and was unable to find a decent image of it online. 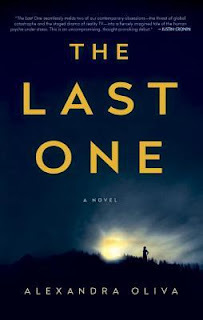 The Last One by Alexandra Oliva has two parallel storylines. The heroine, Zoo, is a contestant in a reality survival series. In her first scene, she's looking for food in a convenience store that's mostly stripped bare. Inside the store, there's a dead body. She thinks it's a prop, not a real dead person. The reader knows, though, that the dead person is real. How did Zoo end up alone and unaware that a deadly illness has ravaged the country? Is anyone alive at all? To find out how events unfolded, the second storyline takes you back to the beginning of the reality series, where you meet the entire cast, the host, the experts, and other people involved in the production of the new survival series. It's been a few weeks since I read the book but I believe the series begins with 12 contestants. Their tasks are simple, at first, and they work in teams. Each of the contestants is given a nickname of some sort (Zoo is not the heroine's real name) and during the chapters that are written from Zoo's point of view, she refers to them by their real names. Trying to figure out which real name goes with which series nickname is part of the fun; it's a bit like solving a puzzle. At first, there are rewards for successfully finishing challenges, with the winner receiving the best prizes (generally survival tools, the best place to sleep, or food). Gradually, the number of contestants is narrowed down, teams change, tasks grow more difficult. When they finally reach the point at which they must go it alone, there is no set date for completion and the remaining contestants are told they'll know when it's over. This is part of the reason Zoo continues to believe she's being challenged when the show has long since ended. 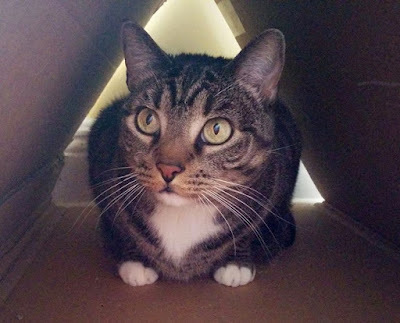 When she becomes uncertain about where she's supposed to go next, she decides to make home her goal. Will Zoo make it home? Is she the only survivor of the pandemic that has wiped out people along her route home? What's become of her husband and the other contestants? Highly recommended, especially to fans of novels about survival - There is one particularly horrifying scene that haunts me, but part of what you get out of The Last One is the sense of what can happen when a person doesn't truly understand what's going on and what kind of pain and regret you can be left with after you realize you've framed your behavior on a certain set of expectations when reality was completely different. I found that the horror gave the book more depth than it would have had if Zoo had not been faced with situations that challenged her morality, as well as her strength and determination. Also, I really loved the uniqueness. I've never read a book that had a reality show as its setting. From what little I've read about the deceptiveness of reality television -- how far it really falls from "reality" -- I thought the author did a good job of portraying what probably really goes on behind the scenes. And, because you get to know all the contestants from the beginning, you root for them like you would if you were watching it unfold on TV. The difference is that you get to know the real people rather than the characters that are being created through careful editing. At any rate, it's a fun read. Fair warning: there are some gruesome scenes. Occasionally, I found myself skimming a little when the contestants had to gut and prepare their meals. I confess, I still don't feel much like blogging so I may take a week or two off, soon, but I got a single book in the mail, today, so at least I have something to share. I've been intrigued by the sound of this story since the author was talking about it, as she wrote, so I finally decided to give in and order a copy. What happened to the concept of the book-buying ban? I need to get on that, again. Lots of one-offs, this week. One book arrival; one book read. On the plus side, it was a good one, although not quite as compelling as Orphan Train. There was good reason I only only finished a single book, last week. I started out chugging along, reading The Widow's House by Carol Goodman but I had trouble figuring out the timeline and ground to a halt. Judging from the ratings and reviews at Goodreads, I must have just missed something; it has mostly positive reviews. I left a bookmark in the book at page 132 and haven't decided whether or not to return to the book, but generally speaking, once I abandon a book, I tend to not return unless I'm close enough to the beginning to consider starting over. I'm including yesterdays Iris of Apology to make the week look better than it really was. And, I didn't get back to the other book that I was uncertain about, last week. I've noticed something interesting about my reading habits. When I'm getting plenty of sleep and feeling good, I tend to balance about 4 books at a time and just bounce from one to another, enjoying the variety. But, when I fall into a slump - which does seem to happen when I'm having trouble sleeping - I can only read one book at a time. 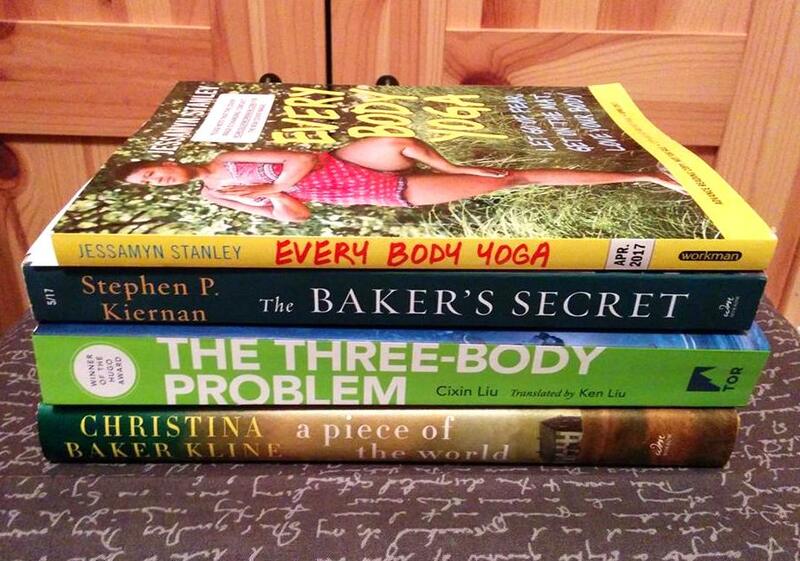 I prefer balancing several books at once, but I'll go with whatever works. Right now, it's clearly a one-book-at-a-time kind of month. Incidentally, I'm enjoying The Mermaid's Daughter, so far. Blah. Just blah. I don't know if it's still the time change that's killing me or I'm just a bad sleeper but I've been waking up several times a night and getting to bed too late, in the first place. Sometimes I can get back to sleep, sometimes I can't. Last night, I fell asleep and stayed asleep for maybe an hour, flopped around like a fish out of water, and finally gave up. I got up, ate some nachos, read a little, fell back to sleep, and woke up early with a migraine. Grrr. On the plus side, I've started doing daily yoga with Adriene on YouTube and I am definitely loving that. I'd forgotten how good yoga makes you feel. So, even if I'm sleeping badly, the yoga helps offset the lack of sleep a bit. I'm not giving up on trying to blog, this week, but if I disappear for a couple weeks, don't worry. I'll be back. If I don't feel like blogging, I'll just skip it. After a decade, if there's one thing I've figured out about blogging, it's that there's no reason to pressure yourself. Life is too short for that nonsense. 11. The Handmaid's Tale by Margaret Atwood - I had only a vague idea what I was getting into when I opened this dystopian modern classic. My expectations were exceeded. The idea of the subjugation of women by an unnamed religious sect is more realistic than most of us would like to admit, judging from discussion with friends. A terrifying, depressing novel that I'm glad I read. 12. March, Book Three by Lewis, Aydin, and Powell - The third in the graphic memoir series starts with the bombing of a church and ends with the signing of the Civil Rights Act by President Johnson. I wish I'd had this series years ago - an excellent tool for educating young and old about what African Americans had to go through to receive basic rights. 13. 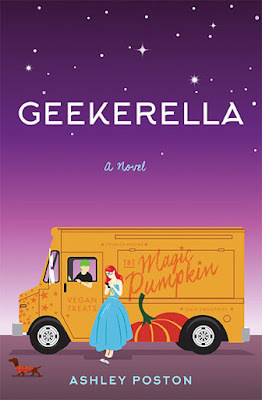 Geekerella by Ashley Poston - Just thinking about this book brings a smile to my face. The story of a geeky 16-year-old who is determined to attend a sci-fi convention and win a cosplay contest in the hopes of escaping the drudgery of her everyday life, sweetened by a texting romance with the star of her favorite cult classic TV show. Charming and full of surprises. 14. Dragon Springs Road by Janie Chang - When a young half-Chinese girl is abandoned by her mother, she is taken in as a bond servant by the family who buys the compound in which she lives and watched over by a magical fox. Because of her mixed heritage, even education won't likely save her from ending up a prostitute or worse. A well-told story about prejudice in early 20th Century China. 15. In Farleigh Field by Rhys Bowen - A bit of mystery and a touch of romance in a WWII setting with a daredevil pilot, a spy, and the woman they both love, a codebreaker at Bletchley Park. A large cast means it takes time to get to know everyone but it's worth hanging in there. I liked the characters, enjoyed the story, didn't feel like the plot was entirely cohesive but found the book a good read, anyway. 16. The Possessions by Sara Flannery Murphy - Eurydice's job is channeling the spirits of the deceased for their loved ones. But, when she becomes obsessed with a particular client, she knowingly endangers her own life. Atmospheric, unique, with a satisfying ending. 17. 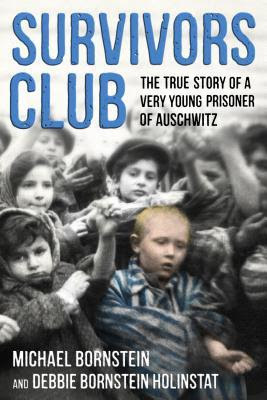 Survivors Club by Michael Bornstein and Debbie Bornstein Holinstat - The story of the Bornstein family with focus on the author, Michael Bornstein, who survived Auschwitz as a very young child. Both heartbreaking and miraculous. This is the first time I've ever read a Holocaust book that describes a man who was in the Judenrat and it was eye-opening what he went through. February was kind of a slumpy month for me, but it had its standouts. Favorites were Geekerella, Survivors Club, and The Handmaid's Tale, even though the latter two were both difficult reads, emotionally speaking. I lost track of how many times Survivors Club brought me to tears. March, Book Three was a satisfying conclusion to the series and I highly recommend the trio, especially for teaching purposes. Dragon Springs Road, In Farleigh Field, and The Possessions were all good in their own ways but I found it difficult to get through Dragon Springs Road and The Possessions. I'm not sure whether they were slow or they just didn't fit my mood. In Farleigh Field was a quicker read - not a perfect one and not a favorite but I enjoyed it. 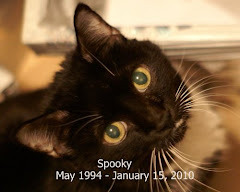 Malarkey didn't happen yesterday because of the time change, which used to not bother me but now totally slays me. The Three-Body Problem by Cixin Liu - My first purchase from a list of books recommended by Barack Obama. Haven't decided whether to do a personal Obama Reading Challenge or just read them as I buy them but The Three-Body Problem is the first in a series, just FYI. Someone tell me how to pronounce that author's name. A Piece of the World by Christina Baker Kline - from William Morrow for review. I requested this one way back in the fall and thought it had become lost in the mail. Maybe they ran out of ARCs? At any rate, it is on my mental short list of most anticipated 2017 releases, along with Alex George's Setting Free the Kites (now available in hardback!) and George Saunders' Lincoln in the Bardo (ditto). Finally, a good reading week! I finished A Man Called Ove, last night, and I think I had tears flowing for at least the last 20 pages. I'm pretty sure that's a record. I'm always telling people that I prefer a book that makes me laugh to one that makes me cry but I think I'd better amend that. There are happy tears and sad tears and I definitely love to be moved, especially if I'm moved to happy tears. A Man Called Ove merged the two kinds of tears and also made me laugh a few times, so it was just an all-around 5-star read. Now, I've got to find a way to view the movie. and one other book, which I'm not far enough into to know if it will stick. Plus, that book of metaphors that I only seem to touch every two weeks or so. She was reading book reviews at Goodreads. Or, someone was. I considered not bothering to review The Handmaid's Tale because I think everyone I know has read it and what could I possibly have to say that hasn't already been said? But, I like to write down my thoughts, so I overruled myself. The Handmaid's Tale is about Offred, a young woman who must dress in a long red dress that covers all but her hands and head. On her hands, she wears gloves when out in public; her head and face are covered with a white headdress with flaps on either side of her face so that she must turn her entire head to see anything not directly in front of her. She goes out to get food rations and meets up with another young lady dressed in red. Sometimes the person she meets is not the same one she walked with, before, and she knows that's a bad thing. When they walk past a wall that used to be part of a university, there are often bodies hanging and Offred looks to see if any of them happens to be her former husband. Before she was Offred, she had another name, a husband, a child, and a job. What happened to her world and why is Offred nothing more than an object that belongs to the man of the house, now, subservient to the man's wife and doomed to labor or death if she doesn't conceive within a certain length of time? Where are Offred's husband and child? Who is in charge in this strange, dystopian world? Not every question is answered but I personally think the way Margaret Atwood gradually reveals the story of Offred's past (if her real name was ever mentioned, I've forgotten it) was masterful. The Handmaid's Tale is both riveting and horrifying. I recall the ending as somewhat hopeful (although it's been over a month and I've forgotten quite a bit, already) but most of the way through the book, the sensation of Offred being utterly and completely trapped overwhelms the small rays of hope. Even when something important changes, there's always the lingering possibility that she could be put to death for that small change in her life. Is this even remotely possible? That's the question that I think most people ask themselves, and they tend to shake it off as ridiculous. But, throughout the reading of The Handmaid's Tale, I kept returning to the thought of women in the Middle East, pre-Al Qaeda and Taliban. 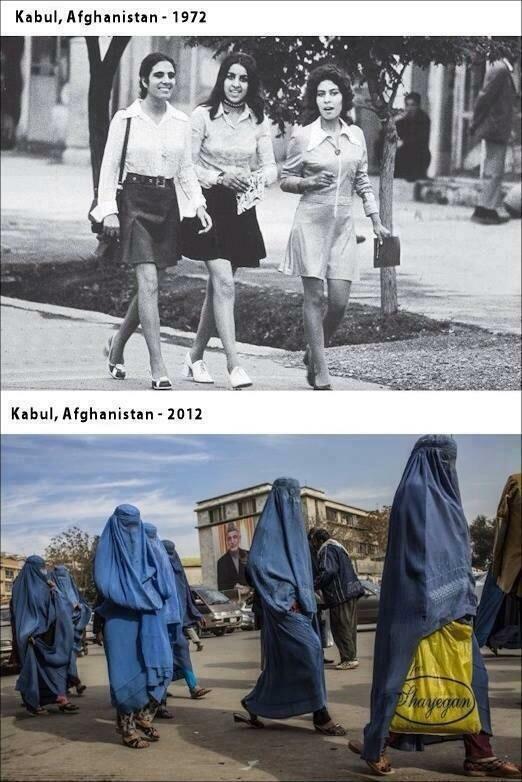 I don't want to post an image that might be copyrighted, so I'll just link to the one that really jumps out at me: Women in Kabul, 1970s and today. The fact that women used to be doctors and lawyers, dressed like women in the Western world, drove, and went to college and actually sometimes had rights before American women achieved them (Afghanistan allowed women to vote before the United States) seems to have been forgotten. In The Handmaid's Tale, the oppressor is unnamed but there are hints that it's a religion dictating the treatment of women as vessels for reproduction or slaves and little else. I found myself wondering if Atwood based the book on what happened in the Middle East. Would women who lived in Kabul in the 70s have imagined what was about to happen to them? I don't think so. And, because of what has already happened in our world, I think I can safely say The Handmaid's Tale is more possible than we'd like to admit. Some of it seems a little far-fetched (the weird ceremonies, for example), but the oppression of women has happened and certainly could happen in other parts of the world. 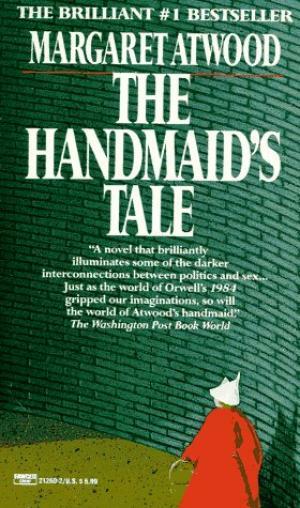 Highly recommended - Mood-wise, The Handmaid's Tale is miserable. It's depressing and terrifying and sometimes gruesome. But, it's so beautifully done and so thought-provoking that I can see why people have been gushing about it for years. 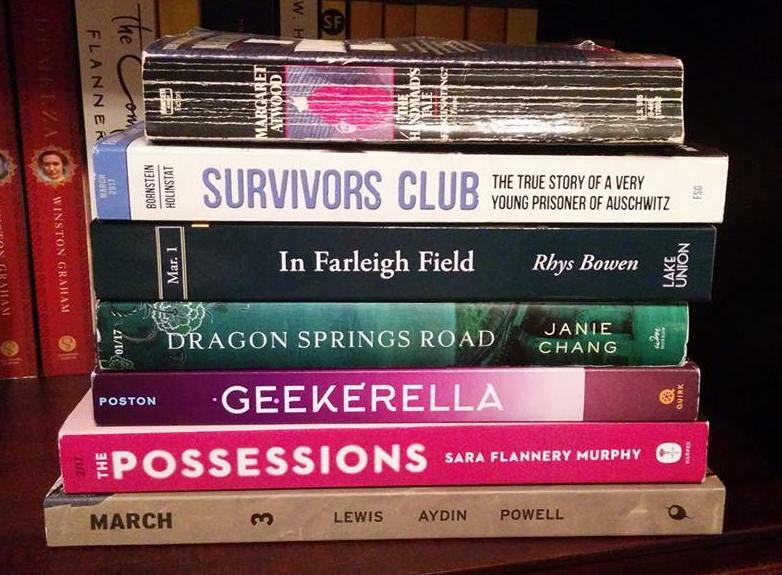 Unlike more recent dystopian reads, many of which are geared toward teen readers, there's no love triangle, no great hatching of a plan to fight back against the oppressor, and the small thread of hope is so slender that it's hard to believe it will amount to anything. I did eventually get to discuss The Handmaid's Tale with an online group, although only a few participated and I keep thinking I would love to someday reread The Handmaid's Tale with my big, noisy F2F group. I'm sure the discussion would be lively. 1. Wouldn't Take Nothing For My Journey Now by Maya Angelou - A book of essays written by the famous poet, including topics such as feminism, diversity, and the brevity of life. I always come away from reading anything by Angelou with deep admiration and a heightened appreciation for life. She was a force of nature. 2. Leopard at the Door by Jennifer McVeigh - After spending several years in England, a young white woman returns to her father's home in Kenya, where the Mau Mau - blacks rebelling against white colonists - are growing more brutal by the day. Rachel has two secrets, both of which endanger her life. 3. Yesternight by Cat Winters - A young psychologist who travels to Oregon schools interviewing children is faced with a unique problem: a young girl who claims to have been a woman who drowned in Kansas and went by the name Violet Sunday in a previous life. 4. Faithful by Alice Hoffman - After a tragic accident leaves her best friend in a coma, Shelby becomes seriously depressed and begins to take drugs. But, surprising change happens when her drug dealer, a boy from school, treats her with unexpected kindness. 5. We Should All Be Feminists by Chimamanda Ngozi Adichie - A very short gulp of a book about feminism, first presented as a TEDx talk. Particularly interesting for Adichie's descriptions of how women are treated in the United States vs. Nigeria, her two homes. 6. The Nightingale by Kristin Hannah - The story of two sisters who are faced with the horrors of occupation in France during WWII. One is married with a child and a husband who has been called up to fight while the other is single and headstrong. Both courageously fight the Nazis in their own way. This was a book group selection and the discussion was excellent. 7. The Wars of the Roosevelts by William J. Mann - A book about the Roosevelt family and their behind-the-scenes battles to both suppress the wilder elements of their family who might interfere with their political aspirations and to rise to power. 8. The Little Book of Hygge by Meik Wiking - Subtitled "Danish Secrets to Happy Living," this book is about how the Danish make their lives happy and cozy. Although a lot of the focus was on doing things during the long winters and our weather is the opposite, I still thought a lot of the suggestions were either applicable or could be altered a bit to fit our need to stay cozy and cool, rather than warm. 9. March, Book One by John Lewis, Andrew Aydin, and Nate Powell - The first in a series of graphic biographies about John Lewis and his participation in the peaceful movement for Civil Rights and the Voting Rights Act, beginning with his love of learning and sense of adventure in childhood. 10. March, Book Two by Lewis, Aydin, and Powell - The second in the graphic trilogy. I don't recall where it began or ended, but the second book was probably focused on the organizations Lewis was involved in, how they trained people to protest peacefully, and the violence that occurred when they did sit-ins and marches. There was enough violence in this second installment that I felt like I needed to take a break before reading the third book. I considered January an excellent reading month, even though the quantity of books read was not huge. 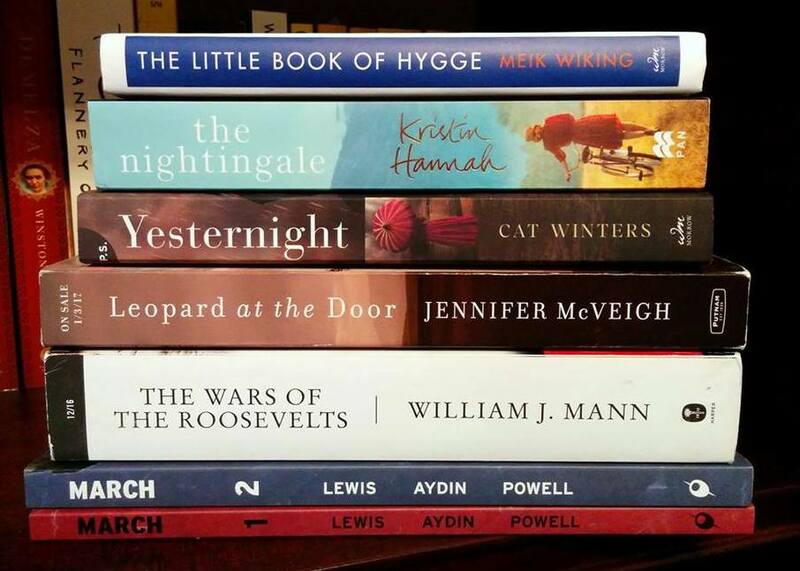 Favorites were Wouldn't Take Nothing For My Journey Now, The Nightingale, The Wars of the Roosevelts, and The Little Book of Hygge. Quite a variety amongst those favorites! I also really enjoyed the first two March books, We Should All Be Feminists, and Faithful. I had some problems with Yesternight, particularly the small final section at the end of the book, which I thought was totally unnecessary. But, I liked the book for its uniqueness and have kind of mentally erased that last section. Leopard at the Door was interesting for the history lesson about the Mau Mau. I'd heard about the Mau Mau Rebellion, but it was not something I really knew a thing about. I found the book awfully slow and I can't say I understood or related to the heroine at all, though; her motivation for keeping one of her secrets made sense but the other one . . . no sense at all. So, it's my least favorite but not a book I feel I should have chucked at the wall. All in all, a pretty terrific month. Two of the books that aren't shown in the picture were books I checked out from my local library and one was (gasp!) an e-book. First note: Survivors Club is written for middle readers. That makes it a quick read because of its length and the writing style, but it is a strenuous read because of the content. Michael Bornstein, who wrote Survivors Club with the help of his daughter Debbie, is the little boy pictured on the cover, colorized and showing off the tattoo on his arm. As a survivor of Auschwitz, he never felt any need to share his story - better to move on with life than focus on the horrors of his past, he thought. Even when he was asked about the tattooed number on his arm, his answer was always a light-hearted brush-off and a change of subject. Then, one day, Bornstein saw a photo of himself, the photo shown on the cover of his book, an outtake from a Soviet film, and he was shocked to find that it was being used as evidence that the Holocaust never occurred. Compelled to finally tell his story, he enlisted his daughter and they set to work researching the family's story. It's not always told from his viewpoint because Michael Bornstein was too young to remember much of what happened and conversations are fictionalized because the authors can only imagine what was said, but the two authors were able to piece together Bornstein's family's story and doing so helped him string his patchy memories together, as well. After describing the reason he decided to share his story, the author returns to the beginning of his family's story, before Michael Bornstein was born, when the Polish town he lived in was being invaded. He tells about how his father buried valuables in the yard just before the Nazis arrived at their house to plunder it of valuables, how his mother kept her wedding ring under her tongue. He talks about the murders his parents witnessed and the slaughter of Jews on what became known as "Bloody Monday". And, that's just the beginning. The situation declined, over the years. First, they were allowed outside the fence-free ghetto, then they were confined within it, and gradually people were sent to concentration camps. While most of the town's residents eventually ended up being marched straight to the gas chambers, his father was one of the Judenrat (the council representing the Jewish community) and he was able to keep many of his family and friends safe for years. He even managed to help hundreds escape, although eventually his his luck ran out and he was no longer able to negotiate with the German he'd been persuading and sometimes bribing for years. I've been reading WWII and Holocaust books all my life, but this is actually the first time I've read anything that describes the perspective of someone who worked in the Judenrat. They're often looked upon as traitors because they had to make the decisions about who was sent away. The difficulty of that job really hits home toward the end, when Bornstein's father had to make the decision to put his in-laws on the list of people who couldn't remain in his small town. By this point, only a limited number who were allowed to stay behind to perform physical labor. The rest were shipped away, most to be marched straight to their deaths after a torturous train ride. Highly recommended - Excellent writing - clear, harrowing, and riveting. I lost count of the number of times I was moved to tears. Although some of the Bornstein family died during WWII, Michael Bornstein's father was able to save many of his family members, thanks to his position in the Judenrat, and the authors are well aware of their family's good fortune. Last week was fun and awful, but mostly fun. 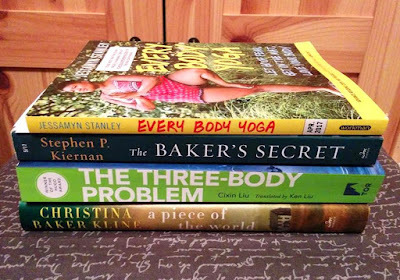 The fun part was an adventure that led to the purchase of the bottom two books on this stack. The awful part was insomnia, which is continuing to dog me, and not a lot of reading. But, today I've made up for the bad part of last week by napping and staying in bed most of the day to finish a book. If you have the ability to catch up after a bad reading week, you should definitely take advantage. The empty chairs were being held and there were only two more rows behind us, which filled quickly. I didn't turn around but I wouldn't be surprised to find that it was Standing Room Only. 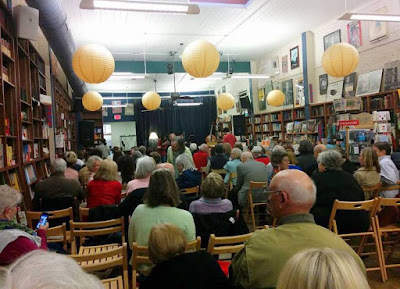 The show was great fun and Alex did a marvelous reading/interview segment. The reason for the large number of posts? 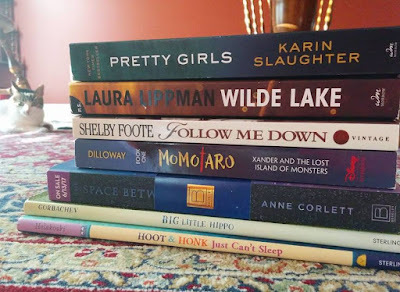 I realized I had not even finished writing reviews of the books I read in January and February was about to end. So, I whipped out 5 of them, finishing up January and nearly completing February because it was kind of a crap month. It's nice not to be quite so far behind. You'll Grow Out of It by Jessi Klein - This was recommended to me as a "feminist" read, by a friend on Twitter. I would not particularly consider it a feminist read; it's more of a memoir with moments of feminist insight. But, it will do. Metaphors Be With You by Mardy Grothe - Someday I'll finish this book. A book of quotations is clearly better as a reference than a book that's read from cover to cover, but I'm enjoying it when I pick it up. It must have at least 50 flags marking favorite quotes - very colorful. 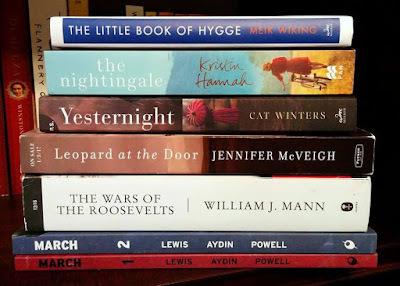 I just finished a fiction read, so I'm in that in-between space, again, but I'll either read the new Joshilyn Jackson or A Man Called Ove (our F2F selection), next. Our trip to Oxford had been on the calendar for months and originally Huzzybuns intended to take Thursday off completely, so we could make a day of it. At the last minute, he found out that there were going to be visitors in the lab and he needed to be there to greet them. So, that's why we just barely made it before Alex George's event began. After he signed my books (the finished copy and my ARC, which I'll give to a friend), we walked to the main store, Square Books, to buy a copy of Lincoln in the Bardo. The employee who rang up my purchase told me there are 166 voices in the audio version and George Saunders recruited people from the audience to play various roles, when he was in town. Oooooh. I wish I'd gotten to see that! We ate out with Kiddo, spent the night in a hotel, then drove up to Memphis to visit our new IKEA store. I cannot even begin to tell you how excited we are to have an IKEA within 4 hours' drive of us. After IKEA, we went to a couple other stores, drove back to Oxford, ate with Kiddo and Fiancee, then we drove home and were completely worthless for the next 24 hours. It was a super fun trip. I'm pretty sure I didn't know what the cover of Geekerella by Ashley Poston looked like when I accepted a copy for review. And, I'm almost positive I would have just skipped right over the offer, if I had. Thank goodness I didn't see the cover - which, obviously, I did not fall in love with (although it is very fitting) - and read the description with care because Geekerella is by far one of my favorite reads of the year, so far. Elle lives in Charleston with a snippy stepmother Catherine and two stepsisters, Chloe and Calliope, all of whom would happily take her house and kick her out, if not for the fact that Elle will own their home as soon as she turns 18. 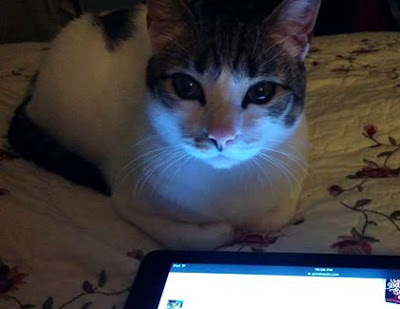 Elle is a big fan of a cult classic TV show Starfield and a relatively unknown blogger and fan fiction writer. But, when she finds out her beloved Prince Carmindor is going to be played by teen actor Darien Freeman in a movie reboot, she writes a sharply-worded blog post about the terrible casting decision and the post is widely read. When she finds out about the cosplay contest at ExcelsiCon, the convention her father created, Elle decides she must try to win. Maybe it will be her ticket out of Charleston and away from her evil stepmother. Darien is a teen star who has been pushed to succeed by his father. But, he really is a geek, at heart. Starfield is his long-time favorite show. He used to attend the annual sci-fi convention till the terrible betrayal of a friend along with stardom combined to keep him away. Now, as the star of the new Starfield movie, Darien is supposed to attend ExcelsiCon and judge a cosplay contest. As soon as he gets the news, he tries to locate the head of ExcelsiCon so he can talk his way out of it. Unable to get through, he texts the number at the ExcelsiCon website and ends up chatting with a fan of the show . . . one who does not like him as an actor at all. While Darien and Elle develop a sweet texting relationship, Elle works in a vegan food truck called The Magic Pumpkin, writes her blog, and tries to figure out how she can get one of her parents' old cosplay costumes to work for her. Meanwhile, the evil stepmother has decided that she wants to sell the house - a house that really belongs to Elle - and one of her stepsisters has decided she must win the ExcelsiCon cosplay contest so she can attend the dance with Darien, even though she has no interest in Starfield at all. Highly recommended - I cannot say enough good things about Geekerella. It is an absolute delight. The geeky aspect is incredibly authentic, from the description of the ExcelsiCon convention to the incredibly detailed storyline of Starfield. In fact, I was so impressed with the description of Starfield that I found myself wishing it really existed. I would happily watch the show if it did. But, what truly made Geekerella wonderful was the relationships. Sage, the daughter of the woman who owns The Magic Pumpkin, seems odd and distant at first, but she and Elle become fast friends. The texting friendship between Elle and Darien builds nice and slowly and eventually becomes incredibly romantic. And, because the book doesn't strictly follow the Cinderella storyline, there is a lovely surprise involving one of the stepsisters. I particularly recommend Geekerella to anyone who likes an upbeat, romantic story about lonely misfits, anyone who enjoys sci-fi and/or fan fiction, and anyone looking for a totally charming upper. I read Geekerella just after finishing 2 of the March graphic novels and The Handmaid's Tale. It was the perfect antidote to both the horrors of reading about people being beaten while they fought for civil rights and a dark, dystopian read. 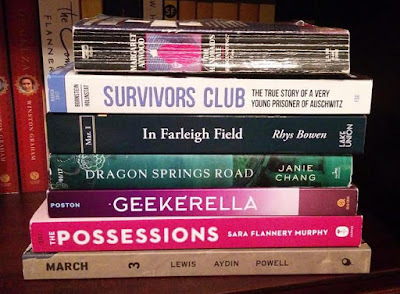 The Possessions by Sara Flannery Murphy is yet another book that I found hard to get through but, like other recent reads, I think part of the fault lies in the fact that I'm just a little slumpy and having trouble finding the perfect books to get me over the hump. Eurydice works for The Elysian Society. Her job is channeling the spirits of deceased loved ones. In her uniform - a sheer, white dress - and items that belonged to the deceased, Eurydice (also known as "Edie") speaks softly to those who are hurting and then takes a small, white pill called a Lotus. The Lotus allows her to step aside while the spirit steps forward and speaks to the living. But, there's an inherent danger in letting someone's spirit take over your body and The Elysian Society has tight rules to prevent such dangers. The distribution of Lotuses is strictly controlled and contact with certain types of spirits is forbidden. When Eurydice finds herself drawn to a client whose wife drowned and another client tries to get Edie to channel a girl who was murdered, Eurydice begins to put her life in danger. How far will she go to find answers about whether or not her client killed his wife? Is she willing to give up her body to someone else in a way that's forbidden? 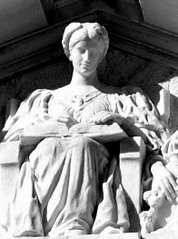 What happened to the murdered girl and was she connected to The Elysian Society? 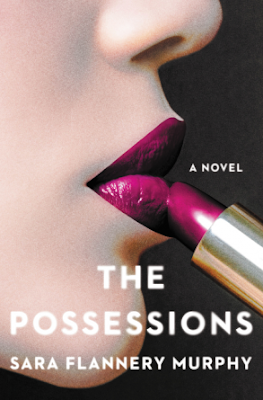 The Possessions is a very moody, atmospheric book and I loved it for that, although I did find it a bit slow. Again, it was almost undoubtedly partly my own mood that made the book drag, but I think there was also a deliberate slow build. And, I was definitely anxious about what was going to happen to Eurydice, as I was reading. Recommended but not a favorite - What I liked best about The Possessions was its uniqueness. I've never read anything quite like it. Not only the idea of channeling, but the concept of a world in which it's common, made it an unusual story. But, there were some little things that gnawed at me. Eventually, you begin to understand why Eurydice (whose real name you never know) is willing to even allow her body to be taken over; the kind of people willing to do such a thing have something in common. But, her secret reasoning for becoming a "body" didn't seem all that plausible to me - at least, the medical portion of it. I did like the ending a lot. But, the overall effect fell flat. Still, the author deserves kudos for the uniqueness of her storyline and the writing is solid. I particularly recommend The Possessions to anyone looking for an atmospheric, unusual read.